Buy local and save money! 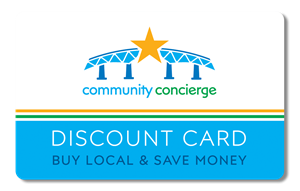 Support your local community and save with the Community Concierge Discount Card. Enjoy 10% or more off goods and services, and a variety of other savings opportunities. Choose from retail stores, museums, restaurants, home improvement companies, and more! SAVE IN BULK: Concierge Cards make a great gift for employees, friends, and family. The more you buy, the more you save!